“The founding fathers put free speech in the Constitution” — well, it’s interesting that college liberals would acknowledge 118 politically-incorrect White men who would be very angry at the censorship of White speech on college campuses today! But really, someone needs to explain to the thousands of college loonies that America is a republic which, unlike a democracy, holds fast to the constitution, which in this case guarantees freedom of speech even if that speech may not be popular with certain people . You know, it’s truly crazy: when a leftist on a college campus talks about “free speech,” he doesn’t mean any free speech, he means “speech that he and his liberal friends, who dominate campus discourse, agree with.” If they don’t agree with your speech, then it’s not free speech, and you “can’t” say it, and the constitution be damned! But newbies, make no mistake: in our White republic, the First Amendment guarantees all speech, not just speech that the liberals want to hear. It’s your constitutional right to say “racist” and “xenophobic” things. If someone censors your White free speech, find a lawyer who will represent you pro bono and file a lawsuit. [Article]. [Update: original link is broken; try This One]. A Republic government will collapse into central despotism as fast as events allow it. The states forced the Federals to secure free speech. The founders tried to pull a fast one. Besides, White people don’t need permission from government agents (STRANGERS) to express their will. 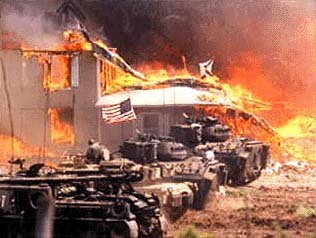 A marauding party of federal agents gleefully slaughtered 76 people at the Branch Church near Waco, Texas (women and children first). The lawless invasion collapsed into a 51 day siege. The inhabitants of the Branch Church fought back instead of crawling in silence. The great conflagration shocked the invaders into reality. They replaced the Federal flag of tyrannical oppression with the FEMA flag of death. The actors and assassins didn’t want the public to identify the Federal ensign with a real Holocaust. Too late. More recently, a team of Federal assassins shot to death at least 6 or 7 bikers of 9 killed at a restaurant in Waco. They fly in and fly out. Am I the only one who cannot get into VNN Forum about 75% of the time?